It’s winter in Hawaii, and yes, Hawaii does get a winter, just not a freezing, snowy winter like the mainland is getting right now. We’ve had some windy and rainy days, but also some nice fishing days as well. We’ve been seeing some nice sized Mahimahi brought in as well as Striped Marlin, Spearfish and Tuna (Ahi and Aku). We’ve also had some nice Blue Marlin reported, with the Magic reporting a 380lb in early February. So there are some nice fish out there, just have to find a nice weather day to go get them. We should be seeing even more Mahimahi in the next few weeks as we get into March, which is prime Mahi season. 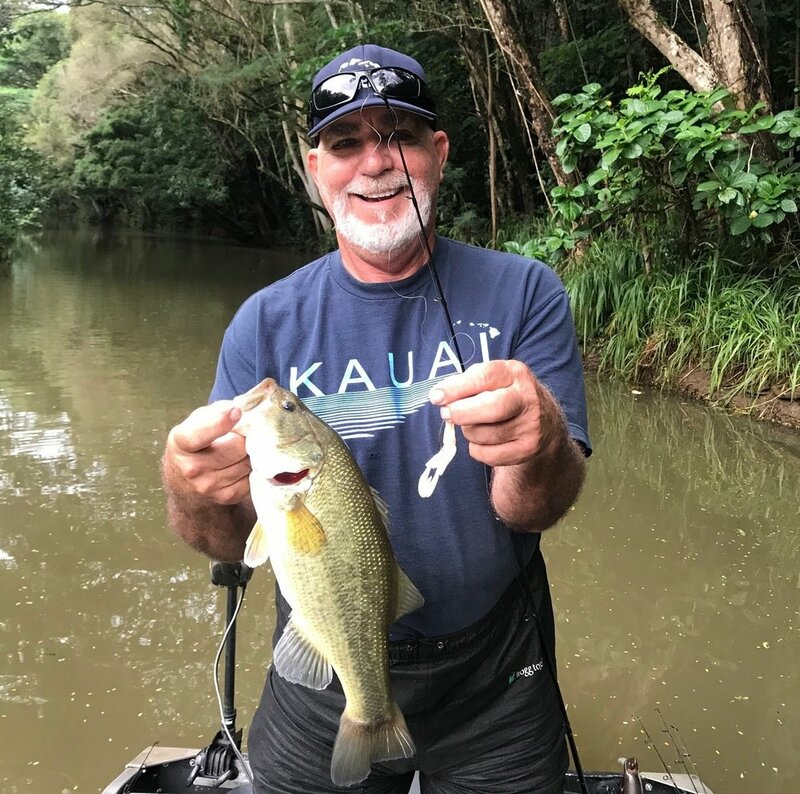 On Kauai, Tom the fresh water bass guide has been catching some good sized small mouth bass. Peacock’s are not biting yet, but he is getting other species. 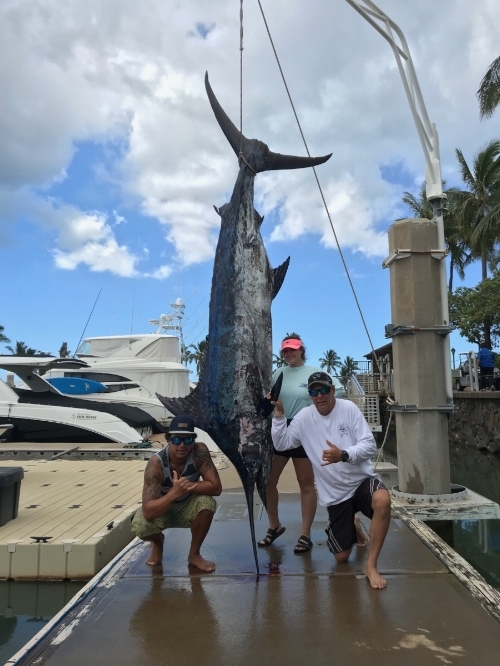 It’s still a lot nicer and warmer in Hawaii than on the mainland, so it’s a great time to take a trip to Hawaii to fish! December is usually the start of the good season for Striped Marlin and quite a few were caught by boats on all the islands. The Stripies usually are in good numbers through the spring so look for more Striped Marlin in the next few months. Blue Marlin are usually a bit less this time of year, but some nice Blues were also hooked up this month. Mahimahi taper off now until around March, however, boats did catch some nice Mahi’s as well in December. The Big Eye Tuna are around as well with Yellowfin also being reported. Overall, December was a good month for Striped Marlin, Blue Marlin, Mahimahi and Tuna. Look for more Spearfish (like a skinny marlin) to show up in January. 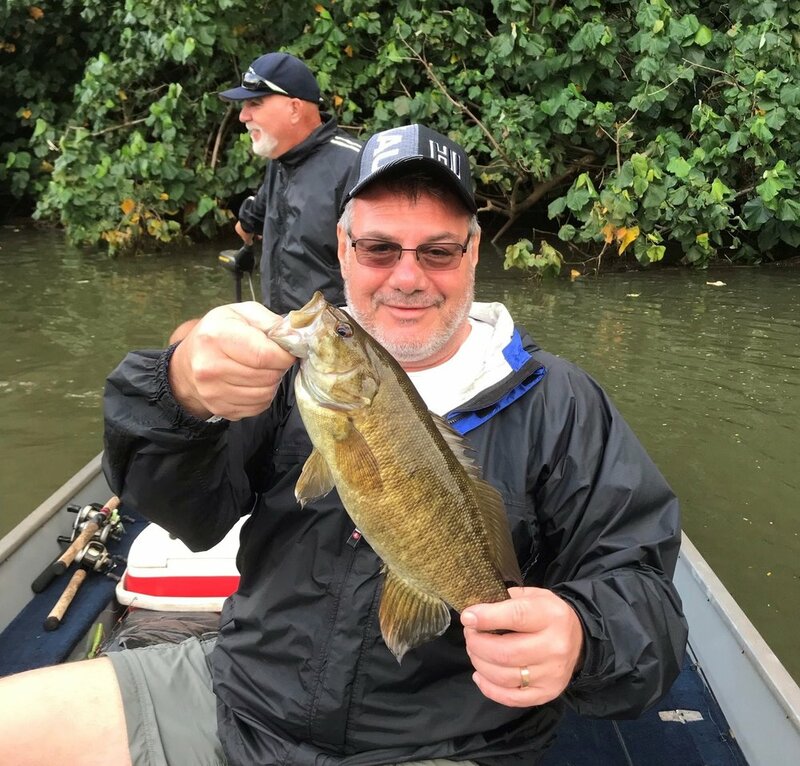 For the bass fishing on Kauai, some rainy days cancelled a few trips, but trips that did run had some nice catches of small mouth bass. Peacock bass usually are not biting this time of year, but you can catch other bass species. 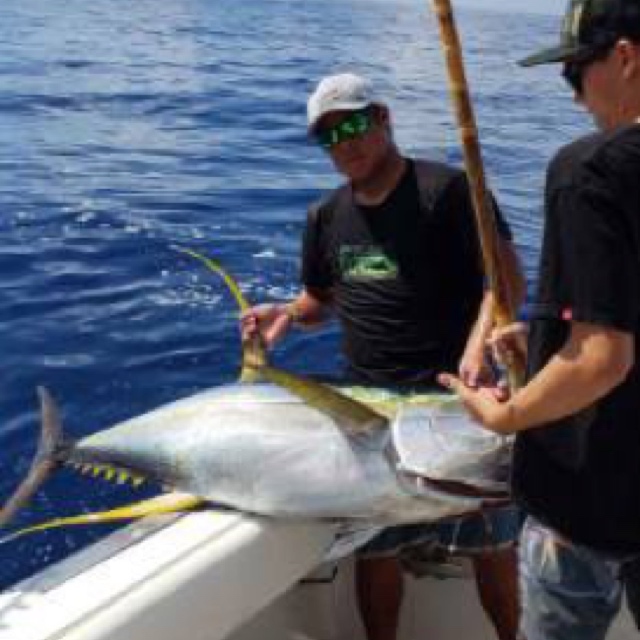 It’s a lot warmer in Hawaii right now than on the mainland, so stash the snow boots and get out your flip flops, come fishing in Hawaii with us! Guide Tom with a nice bass catch! June marks the start of the summer season which means Blue Marlin, Ono and Ahi begnning to show up in full force. Some large Blue Marin over 300lbs were reported in June along with some smaller ones in the 100lb+ range. We also had some nice Ahi brought in in the 100lb+ range. Other fish caught have been Spearfish (looks like a skinny marlin) and Ono. Look for more Blues and Ahi to be caught into July and the remainder of the summer. Best time for the big Blue Marlin is June through September. For the bass fishing on Kauai, we had some unusual heavy rains late in the spring so Tom was not able to get out as many days as he liked. The weather eventually improved and Tom found some nice good sized largemouth bass in the 5-7lb range. Peacock bass have not been biting too good yet, so hopefully they will start biting in July as the weather warms up and the rains subside. You never know with the Peacock Bass when they will decide it's time to bite so we just keep trying for them.